Come to Mansfield Superbowl this weekend for our Sunday Special. 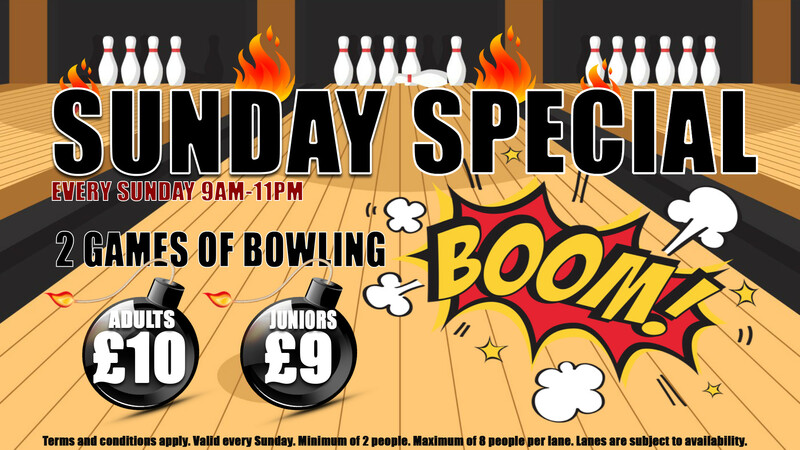 You can get two games of bowling for just £10 for adults & £9 for juniors. This offer is a great way to round off the weekend & is available all day on Sundays. Not available during the Christmas school holidays and February Half Term. 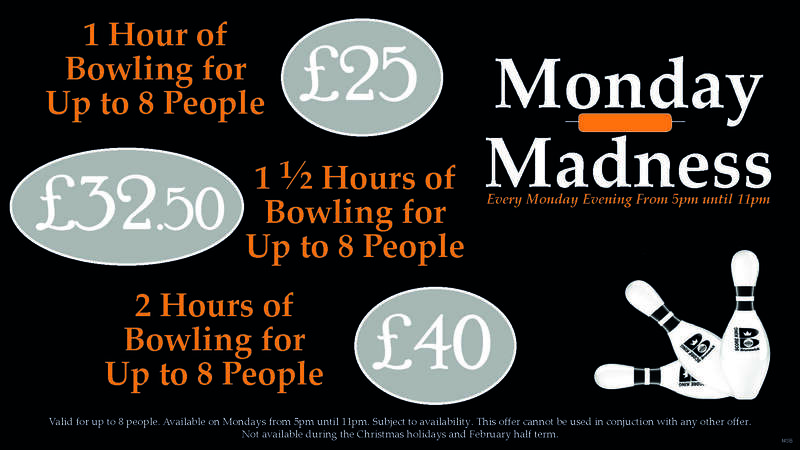 Head on down to Mansfield Superbowl on Mondays to get 1 hours bowling for up to 8 people for £25, 1 1/2 hours for £32.50 or 2 hours for just £40! Valid on Mondays from 5pm until 11pm. This offer is not available during February Half Term or the Christmas School Holidays. 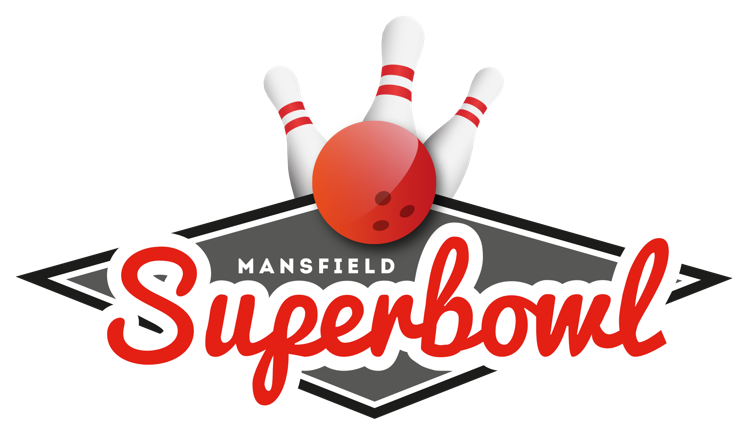 Come to Mansfield Superbowl on a Tuesday or Wednesday evening between 5pm and 11:30pm and you can enjoy 2 games of bowling for the bargain price of just £11 per adult and £8 per child! And thats not all. 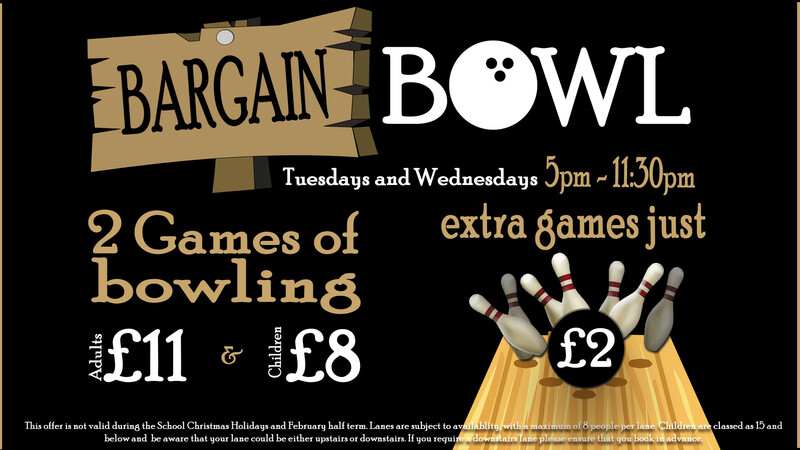 If you would like additional games its only £2 extra per person! You'd be foolish to miss out.Not available during the Christmas holidays and February half terms. Have a drink on us! 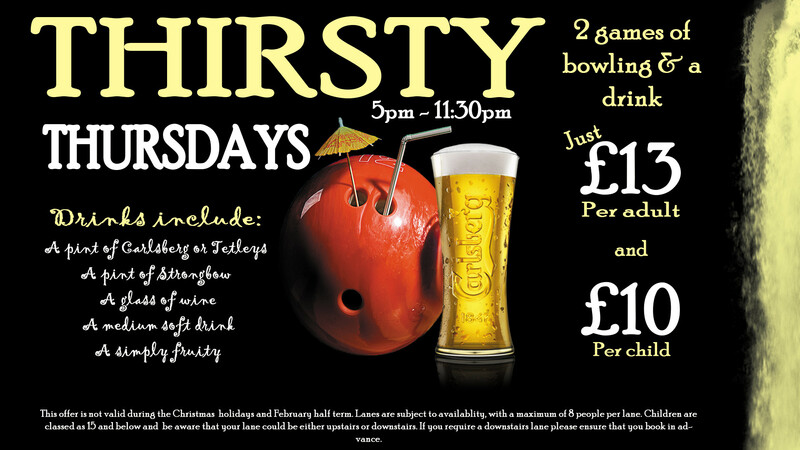 Come in on a Thursday between 5pm-11:30pm and get two games of bowling along with a complimentary drink for just £13 per adult and £10 per child. Drinks include; A pint of Carlsberg, Tetleys or Strongbow, a glass of wine, a medium soft drink or a Simply Fruity/Fruit Shoot. Not available during the Christmas holidays and February half terms. 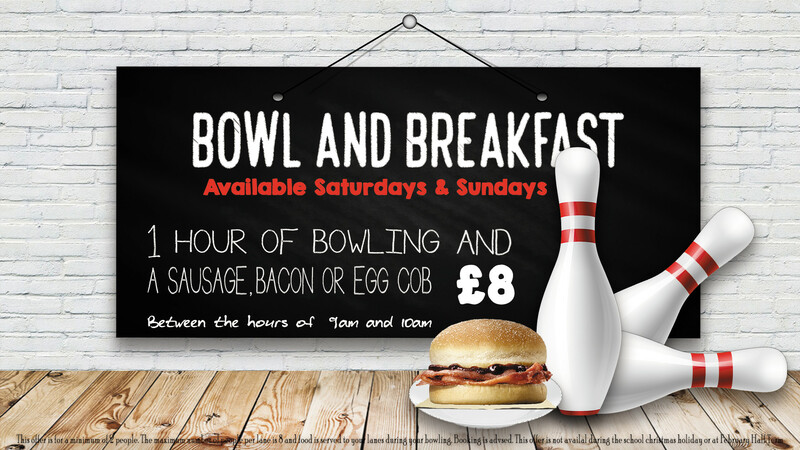 Available on Saturday and Sunday mornings from 9am until 11am you can get a tasty Bacon, Sausage or Egg Cob and an hour of bowling for just £8 per person. Please be aware that your lane must start by 10am & you must have a minimum of 2 people. Not available during the Christmas holidays and February half terms. 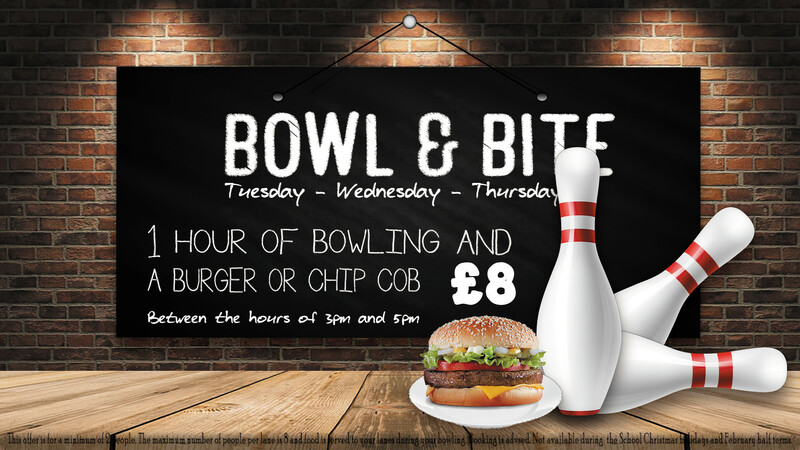 Available every Tuesday, Wednesday and Thursday between the hours of 3pm and 5pm you can enjoy 1 hour of bowling plus a delicious burger or chip cob for just £8 per person. This offer is subject to availability and booking is advised. Minimum of 2 people per lane. Not available during the Christmas holidays and February half terms.